Welcome to Day 20 of the 31 Days 31 Printables series. If you’re just joining us, I’m spending the whole month of October sharing at least one free printable each day. 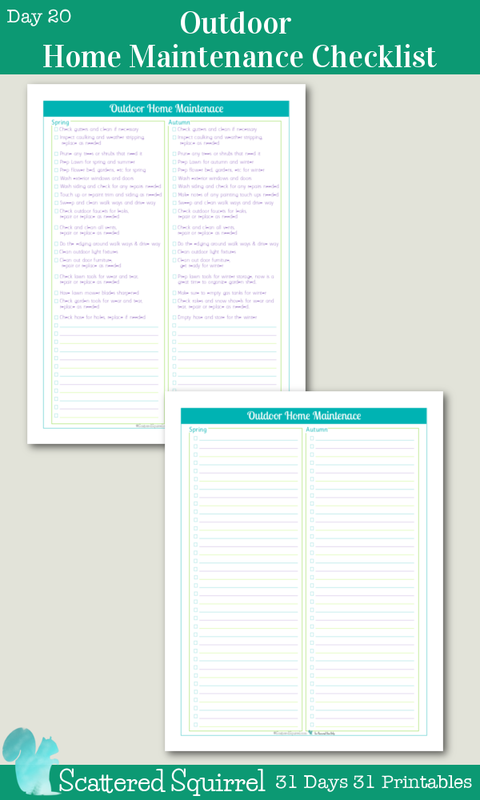 Right now I’m working on updating my home management binder printables. For Day 19 I shared the Indoor Home Maintenance Checklist, and I thought it would be rather fitting to follow those up with the Outdoor Maintenance Checklists. 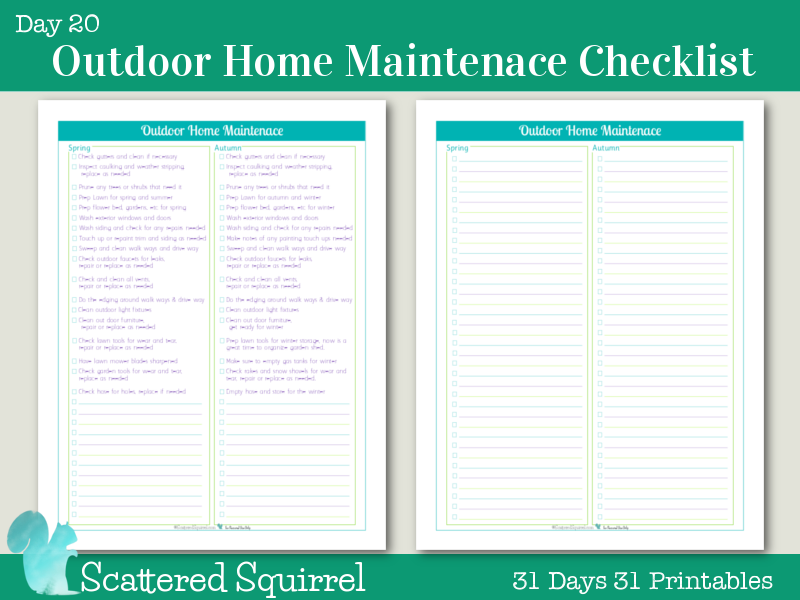 Like its indoor counterpart, I created the Outdoor Home Maintenance Checklist to help me keep up on all the things that need to be done in the yard and to help care for the exterior of our home. 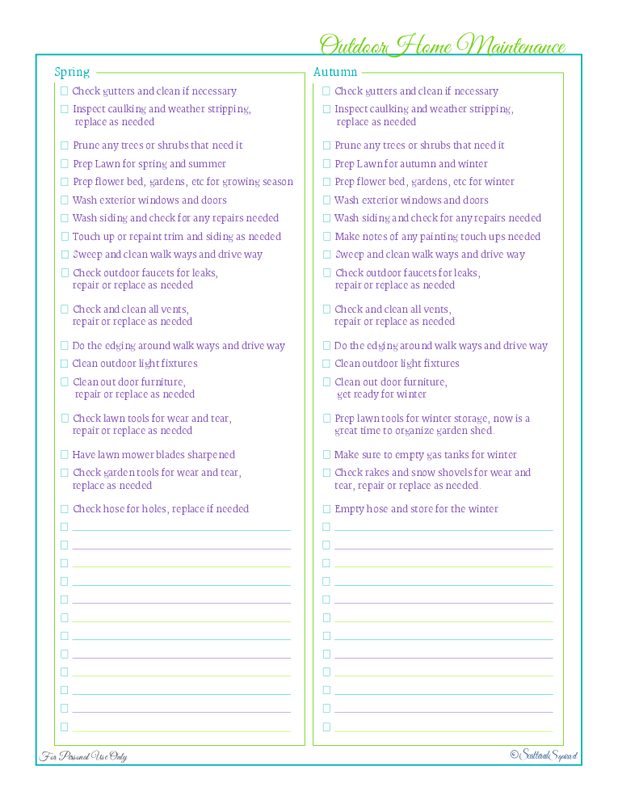 This printable keeps track of those seasonal tasks that need to get done each year to ready our homes for the colder months and to open our homes up for the warmer months. 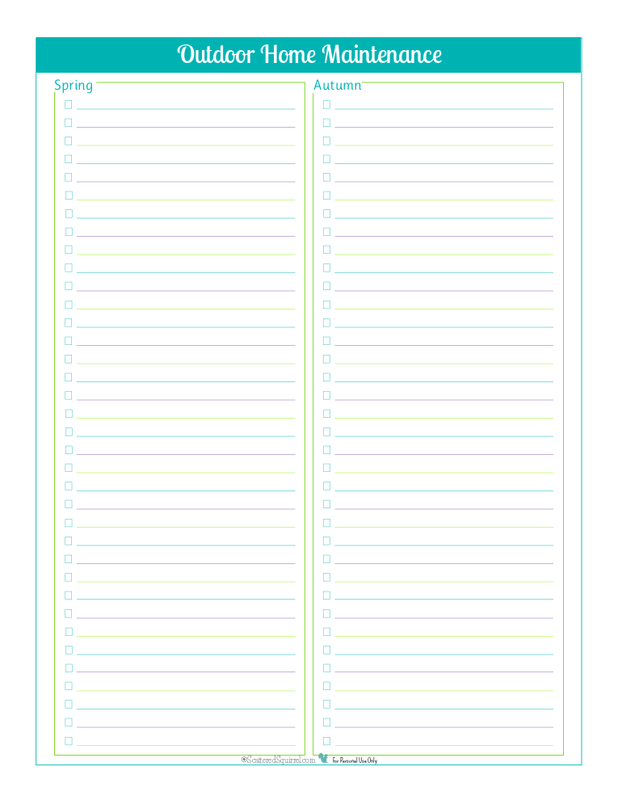 These tasks are not ones I think of often, in fact after creating this printable I don’t really think about them at all. 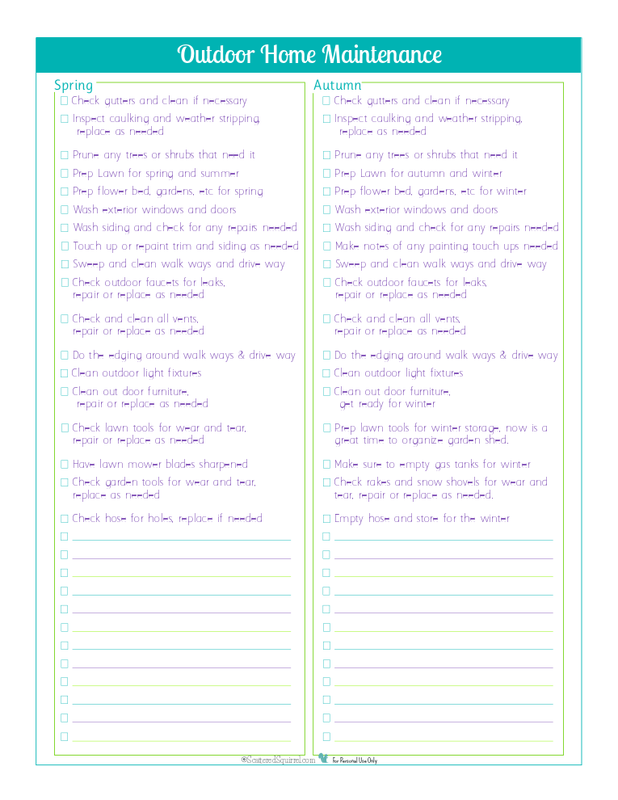 I just pull out the checklist in the spring and follow the list, and I do the same thing in the autumn. I really love it when I don’t have to put much thought into what I need to do. As I mentioned yesterday, and above, the reason I love checklists so much is because they take the thinking out of the equation. When the leave start changing and falling from the trees I don’t have to set time aside to make up a list of everything I need to do to ready my home for winter. I just flip open my HMB, find my Outdoor Home Maintenance checklist and schedule out the tasks on the list. I don’t have to worry about forgetting to do something, it’s already written down for me. And just like the last one all I did was change up the fonts and change the header area. That’s it! I’m working on the keep-it-simple-silly principle. And of course I made a blank version. When I first created my Outdoor Home Maintenance checklist, I spent a ton of time really thinking about what tasks I needed to do to maintain the exterior of my home and my yard. The more I thought about the more I realized that most of these jobs are seasonal or even annual. So that’s why I created it into seasons rather than breaking it down on a month by month basis. We set aside a couple of weekends in the spring and autumn to tackle most of these jobs, and we try to make it a family affair. The more helping hands doing the work, the faster it is done and the sooner we can move on to more fun things, like that last picnic before it’s too cold and damp to sit outside, or the first picnic of the year, depending upon the season. What tasks do you do to maintain the exterior of your home and your yard?